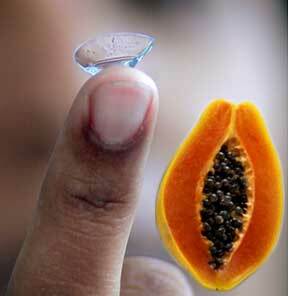 THERE is an ever-rising demand for papain, an enzyme secreted by the papaya plant. Widely used in the preservation of spices, digestive aids and as a contact lens cleaner, it also finds applications in meat tenderization, beer clarification and blood stain removal. However, the extraction of papain from its natural sources and its subsequent purification is quite cumbersome. Researchers working to devise methods to produce papain in the lab, so far, could come up with techniques that yielded low amounts. A Kolkata team used two things to achieve high yields: a simple genetic alteration and a bacterium. The scientists isolated the propapain-coding gene (propapain is the precursor protein to papain) from young leaves of the papaya plant, altered it slightly and inserted it into the bacterium Escherichia coli.About 1 litre of the bacteria, when cultured, yielded 400 mg of propapain. After that the team took over and in the presence of cysteine (an amino acid) and at an ideal temperature of 50C, converted propapain to active papain. "This method is advantageous as it becomes totally independent of the natural source," said lead researcher Jiban Kanti Dattagupta from the Crystallography and Molecular Biology Division of Saha Institute of Nuclear Physics, Kolkata. The team also said the process is cost-effective. The activity of the lab-produced papain closely resembled its native counterpart and the yield was the highest to date for any recombinant papain-like plant enzyme, said the study published in a recent issue of Phytochemistry (Vol 70, No 4). "Our method opens up the possibility of modulating the properties of proteins (like papain) through protein engineering according to practical needs," added Dattagupta.